Ace of Spades HQ is far too responsible and classy an outfit to ever engage in this sort of cheap speculation. It fills me with "heart-ache" that I'm required to even link such vile filth. 1. 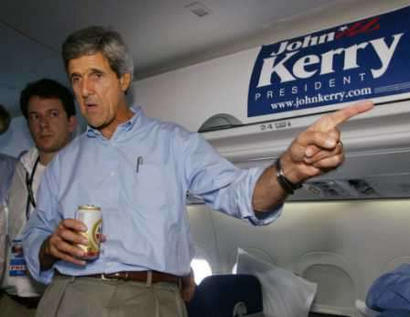 While no one can say with certainty whether John Kerry was drunk, except, perhaps, for the bartender who got him all loaded up and sloppy, Kerry does not perform well when trailing. I certainly would not go so far as to speculate about this decorated war hero hitting the sauce in anaesthetized desperation, but I would say that I wouldn't blame him if he sought solace in a bottle, which, let's face it, he almost certainly did. 2. I'm so pumped right now. Actually, rumor has it that John Forbes Kerry was pretty "pumped" last night, too. 3. Just because the inability to perform routine mathematical operations is a classic sign of intoxication, there is no reason to draw any conclusions from John Kerry's numerical confusion last night. Let us not speculate about him saying, "I have five words for America: This is your wake up call." (Count them.) Nor should we read anything into his claim that the Red Sox had moved 2 and a half back from the Yanks, when in fact they moved THREE and a half back. We cannot conclude from that slender evidence that Kerry may have downed one or a dozen highballs before speaking, although we all damn well know he did. 4. And most importantly: Getting sloppy slosh-drunk for a campaign rally doesn't indicate anything about one's job performance as President, except to the extent a President is called upon to make lucid decisions about life-and-death matters of national security, and honestly, how often does that come up? No more than four or five times a week, tops. What business is that of mine? Who are we to judge chronic drunks, gutter-rummies, and railroad hobos such as John Forbes Kerry? Completely Unrelated Link Having Nothing At All Whatsoever to Do With John Forbes Kerry's state of inebriation: If you missed it, here are the Top Ten Signs That a Bear Might Be Drunk. This has nothing to do with John Forbes Kerry. Read nothing into it, because John Forbes Kerry is quite plainly not a bear. At least, I assume he's not a bear. Honestly, who can say at this point. I haven't seen a DNA test proving he's human, and no one else has, either. I suppose it's quite possible that he's some sort of shaved-down mutant "manimal" created in order to infiltrate our society and ultimately destroy all human life, but really, there's little evidence of that at this point. Let's just call it an open question whether John Kerry is a kind of ursine Terminator fueled only by a hatred of the human species and copious quantities of peach schnapps. And on that last point, I see no reason whatsoever to follow NRO down into the gutter of cheap slanders and start calling John Kerry "Senator Schnapps" or "the Schnappster" or even "Schnappmaster McDrunkerton" or, worst of all, "Schnappy, the Genetic-Monstrosity Bear-Thing Intent on Enslaving the World." Let's keep this civil. Let's keep this on the issues. And the issues are 1, whether John Kerry is a falling-down drunk, and 2, whether he can balance a ball on his nose while riding a tricycle? I will speak no more of these vicious innuendos until I can think of something else funny to say. Pardon me, I'm a drittle bit lunk. I love you, man! But Seriously: I didn't see enough of him to make that sort of evaluation. He looked a little dazed and out of it, but I don't think we need to blame that on the hooch. Kerry does not perform well when trailing, whether sober or feeling no pain. And, by the way, I consider that to be a near-disqualification for the presidency. When Bush was down -- and he was down for half a year -- he did not let you see him sweat. He was sweating, of course, but he held it together. We can't afford a Commander in Chief who very visibly goes all to pieces when a poll shows him losing four points. A man who gets rattled by the likes of Howard Dean and Zell Miller isn't the man we want negotiating with Kim Jong Il. Thanks to See-Dubya for the Kerry beer pic.